We, rayonists and futurists, do not wish to speak about new or old art, and even less about modern Western art. We leave the old art to die and leave the “new” art to do battle with it; and incidentally, apart from a battle and a very easy one, the “new” art cannot advance anything of its own. It is useful to put manure on barren ground, but this dirty work does not interest us. People shout about enemies closing in on them, but in fact, these enemies are, in any case, their closest friends. Their argument with old art long since departed is nothing but a resurrection of the dead, a boring, decadent love of paltriness and a stupid desire to march at the head of contemporary, philistine interests. We are not declaring any war, for where can we find an opponent our equal? The future is behind us. All the same we will crush in our advance all those who undermine us and all those who stand aside. We don’t need popularization – our art will, in any case, take its full place in life – that’s a matter of time. We don’t need debates and lectures, and if we sometimes organize them, then that’s by way of a gesture to public impatience. While the artistic throne is empty, and narrow-mindedness, deprived of its privileges, is running around calling for battle with departed ghosts, we push it out of the way, sit up on the throne, and reign until a regal deputy comes and replaces us. We, artists of art’s future paths, stretch out our hand to the futurists, in spite of all their mistakes, but express our utmost scorn for the so-called egofuturists and neofuturists, talentless banal people, the same as the members of the Jack of Diamonds, Slap in the Face of Public Taste, and Union of Youth groups. We let sleeping dogs lie, we don’t bring fools to their senses, we call trivial people trivial to their faces, and we are ever ready to defend our interests actively. We despise and brand as artistic lackeys all those who move against a background of old or new art and go about their trivial business. Simple, uncorrupted people are closer to us than this artistic husk that clings to modern art, like flies to honey. To our way of thinking, mediocrity that proclaims new ideas of art is as unnecessary and vulgar as if it were proclaiming old ideas. This is a sharp stab in the heart for all who cling to so-called modern art, making their names in speeches against renowned little old men – despite the fact that between them and the latter there is essentially not much difference. 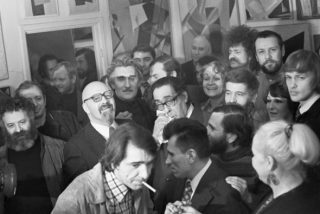 These are true brothers in spirit – the wretched rags of contemporaneity, for who needs the peaceful renovating enterprises of those people who make a hubbub about modern art, who haven’t advanced a single thesis of their own, and who express long-familiar artistic truths in their own words! We’ve had enough Jacks of Diamonds whose miserable art is screened by this title, enough slaps in the face given by the hand of a baby suffering from wretched old age, enough unions of old and young! We don’t need to square vulgar accounts with public taste – let those indulge in this who on paper give a slap in the face, but who, in fact, stretch out their hands for alms. We’ve had enough of this manure; now we need to sow. 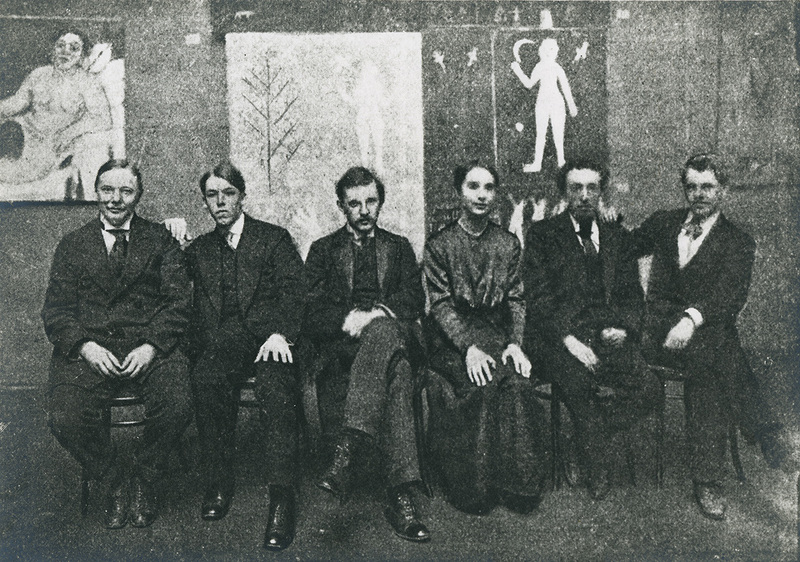 We have no modesty – we declare this bluntly and frankly – we consider ourselves to be the creators of modern art. We have our own artistic honor, which we are prepared to defend to the last with all the means at our disposal. We laugh at the words “old art” and “new art” – that’s nonsense invented by idle philistines. We spare no strength to make the sacred tree of art grow to great heights, and what does it matter to us that little parasites swarm in its shadow – let them, they know of the tree’s existence from its shadow. Art for life and even more – life for art! We exclaim: the whole brilliant style of modern times – our trousers, jackets, shoes, trolleys, cars, airplanes, railways, grandiose steamships – is fascinating, is a great epoch, one that has known no equal in the entire history of the world. We reject individuality as having no meaning for the examination of a work of art. One has to appeal only to a work of art, and one can examine it only by proceeding from the laws according to which it was created. Long live the beautiful East! We are joining forces with contemporary Eastern artists to work together. Long live nationality! We march hand in hand with our ordinary house painters. Long live the style of rayonist painting that we created – free from concrete forms, existing and developing according to painterly laws! We declare that there has never been such a thing as a copy and recommend painting from pictures painted before the present day. We maintain that art cannot be examined from the point of view of time. We acknowledge all styles as suitable for the expression of our art, styles existing both yesterday and today – for example, cubism, futurism, orphism, and their synthesis, rayonism, for which the art of the past, like life, is an object of observation. We are against the West, which is vulgarizing our forms and Eastern forms, and which is bringing down the level of everything. We demand a knowledge of painterly craftsmanship. More than anything else, we value intensity of feeling and its great sense of uplifting. We believe that the whole world can be expressed fully in painterly forms: Life, Poetry, Music, Philosophy. We aspire to the glorification of our art and work for its sake and for the sake of our future creations. We wish to leave deep footprints behind us, and this is an honorable wish. We advance our works and principles to the fore; we ceaselessly change them and put them into practice. We are against art societies, for they lead to stagnation. We do not demand public attention and ask that it should not be demanded from us. The style of rayonist painting that we advance signifies spatial forms arising from the intersection of the reflected rays of various objects, forms chosen by the artist’s will. The ray is depicted provisionally on the surface by a colored line. That which is valuable for the lover of painting finds its maximum expression in a rayonist picture. The objects that we see in life play no role here, but that which is the essence of painting itself can be shown here best of all-the combination of color, its saturation, the relation of colored masses, depth, texture; anyone who is interested in painting can give his full attention to all these things. The picture appears to be slippery; it imparts a sensation of the extra-temporal, of the spatial. In it arises the sensation of what could be called the fourth dimension, because its length, breadth, and density of the layer of paint are the only signs of the outside world – all the sensations that arise from the picture are of a different order; in this way painting becomes equal to music while remaining itself. At this juncture a kind of painting emerges that can be mastered by following precisely the laws of color and its transference onto the canvas. Hence the creation of new forms whose meaning and expressiveness depend exclusively on the degree of intensity of tone and the position that it occupies in relation to other tones. Hence the natural downfall of all existing styles and forms in all the art of the past-since they, like life, are merely objects for better perception and pictorial construction. With this begins the true liberation of painting and its life in accordance only with its own laws, a self-sufficient painting, with its own forms, color, and timbre. 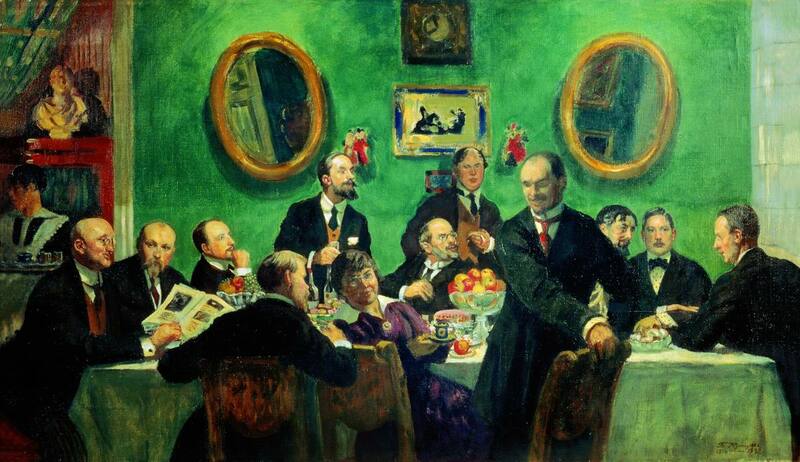 Photo credit: “Members of the World of Art Movement”, Boris Kustodiev (1916-1920).